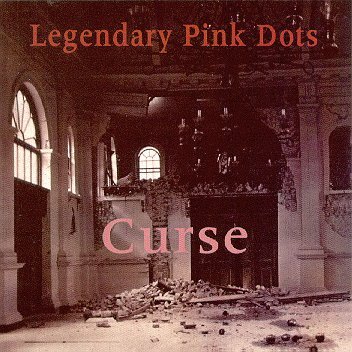 The Legendary Pink Dots, "Curse"
Another place. A different story. Fingers play with stale cigars. Business creeks, the warehouse leaks, the chairman sold his daughter's car. He's reading charts and sharpening knives for cutting when the time seems right - for him alone. 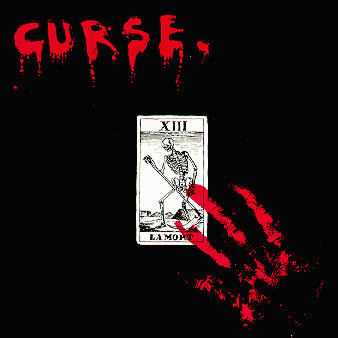 No pause for mercy if the victim's out of sight. Equality is a word for cranks to shout out as the batons swing. It's beautiful in theory... he knows it's not for him. He's got his fodder! But there are other bullets, other walls, where justice cries in shiny red. 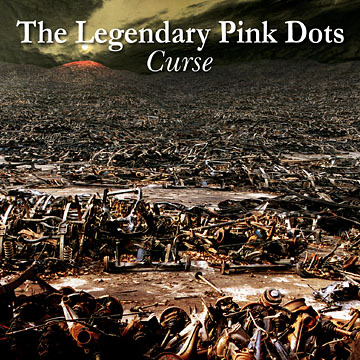 Where reason dies and passion burns persuasion's just a hole in the head. Purges after midnight... There's no discretion in the mass. A volley. A silence as they cover up the mess. Don't kid yourself. You're civilized - it could happen anywhere. In choking cities, steaming jungles... maybe even here. The retinue wore togas, toked on opium and drank each's other's wine. They nibbled peanuts, spoke of heinous and premeditated crimes between the politics and the poems. Conversation stayed refined at Lisa's party. having a real good time. A legendary film star smashed a glass when a man guessed at her age. The ceiling opened and revealed the naked lady in a cage. A fireater scorched his chin and departed in a rage from Lisa's party. Isn't it jolly fun? An artist bit a chicken's head off and laughed as he passed the rest around. Pieces quivered their coctail sticks but were swallowed without a sound. A trampolinist jumped too high came crashing to the ground at Lisa's party. Isn't it a whizz! Now Lisa was the perfect hostess... She planned a big surprise. She spread the cyanide in layers across her delicate mince pies and told her guests "A hint of almond makes the dullest cake seem nice." And they all died. Waving at the aeroplanes... See my hand swing left swing right. Milk white in the dawn sky, dives to the brown earth. Bound to an arc that only I can see. See me crouch on the grass, on the concrete; eyes slit tight, fist clenched and bleeding. Faith moves mountains headfirst into seas. Waving at the aeroplanes... make them crash crash crash on the runway, crash on the motorway. I'll show them how it pays to just wave back... Wave back to me to me... They crack in the dawn, get wrapped in the cloud shroud. It's raining limbs, white wings and aspirins. Pitter patter scatter brains and burn... Fly me!!! The kitchen smells of parafin, the stairways turning black and teddy's looking tired cause he's lying on his back. Crackling curtains dance in ribbons, flames are waltzing down the hall - a beetle turns a summersault in a matchbox by the wall. He's getting restless with his lettuce. Frying tonight in the Dolls House! Mummy's smiling with a match, blows softly through the doorway and draws patterns in the ash. Crackle Crackle Flash Flash! Golly's leaning out of the window. He gives a little wave and as only gollys can but he can't come out to play. Sparks creep up his trouser leg but he doesnt care cause he's busy watching mummy comb her curly hair. Very pretty on the setee... Playing tonight in the dolls house. Mummys smiling with a match, blows softly thru the doorway and draws patterns in the ash. Fizzle Fizzle Zap Zap! Up on the second floor little Wendy takes a bath; her skin is melting slowly but she manages to laugh. She knows a dozen words or more; she's always so polite - pull her string out slowly and she'll sing all thru the night, sing forever - really clever! Frying tonight in the dolls house but mommys getting bored; she tore up all her comics 'cos she's not a kiddie anymore. Nor is Daddy. "Don't mind me..." she whispered. "Go ahead and do just what you want to do. Go rob a bank or go smash a window. I'll be waiting here with your slippers and your tea. If they haul you off to jail, I'll visit every Tuesday. I'll keep the chainlock on the door and buy everything mail-order. I'll plant those photographs of you on every wall, in every corner. I'll have you staring from the ceiling, I'll stay loyal even when I'm dreaming. I'll see no-one else at all. You're my universe, my guide, my reason for existence. I'll do anything you ask me - anything at all I belong to you. BELONG! You own me, made me, have the power to destroy me... Go ahead I'm yours. I'm yours. I'm on all fours, just do the hell what you like! I'm yours! You have my soul. Sell it if you want to. I'm yours. I'm yours. I'm yours. Go ahead, sell my soul. I'm yours..."